the vintage umbrella: color inspiration Monday... orange! Today's color inspiration is an easy choice at this time of year.... orange! The little tin box just got a coat of orange spray paint. I love the brand of paint... it's Rustoleum. All brands of spray paint are not created equal people. I made this Halloween project last year... look how cute it is in this orange frame. I used the same orange spray paint on this frame. This bucket got a coat of it too. I got it at a garage sale for $1. I'm going to do something fun with it later this week. This is such a cute idea... use an old tin tray as a magnet board. The magnets are little magnet circles with an orange button glued on top. I was ridiculously excited when the grocery store put their pumpkins out. This one is cute on this orange pedestal. I got this scarecrow at junkmarket last year. Darn, he is cute. Are you inspired to get your fall decorating started? Have a great day! Totally inspired! Pumpkin patch almost done. 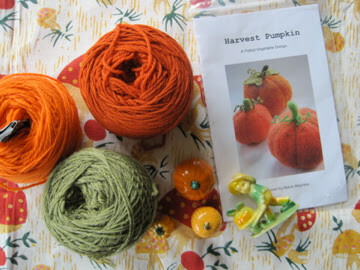 Working on a pumpkin hat for my son right now. Is that orange pedestal the same one you had painted white? or do you have more than one?? So cute! And I love the ruler tray above...very cute! the ruler tray is a little stool I got at junk market last year. I just saw a bunch of ruler crafts in country home magazine... aren't they cute? !